John Pappas is Head Librarian at the Elkins Park Free Public Library, Cheltenham Township Library System. He has contributed numerous WebJunction articles and presented a webinar on board games and libraries and he blogs at Board in the Library. I fully expect that the flood of amazing games is going to slow down eventually. To abate somewhat. Maybe even decline. Yet, every year ends up being as amazing as the previous. Until I looked back, I thought 2017 was a fairly average year. However, for gaming, the year was actually stellar with some amazing releases. As I state every year, it is impossible to play and review even a small portion of all of the games released in a year. It is even harder to recommend them to libraries when that audience is so diverse, communities so varied, plus the added challenge of focusing on the unique needs of circulating collections. That said, I limited the list down to nine games that will make wonderful additions to your library’s collection. I try to recommend game with a small learning curve so most of these games are perfect for a budding collections (Herbaceous, Photosynthesis) and if I do include more complex games, they are worth the extra time it takes to learn and will be a better addition to an already established collection (London: 2nd Edition, Wasteland Express Delivery Service). Some games just barely missed the cut but are still worth your time. Spirit Island is amazing but was too complex for new players. I was unable to play Codenames: Duet or Dinosaur Island in time for this list. Azul is gorgeous and Plan B Games is doing an amazing job with such a small catalog but I couldn’t get enough plays in to be able to review it. The same goes with Queendomino (the older sibling of last year’s Kingdomino) from Blue Orange Games. Renegade Game Studios is releasing a trilogy of games from designer Shem Phillips that have my beard all aglow — The North Sea Trilogy — Shipwrights of the North Sea, Raiders of the North Sea, and Explorers of the North Sea. I am in love with Raiders but it is a 2015 title so I left it out. There are dozens more worth discussing and recommending to you and I hope that this shortened list serves as a good representation for what 2017 has offered. If you have opinions share them here or at the League of Librarian Gamers Facebook Group. 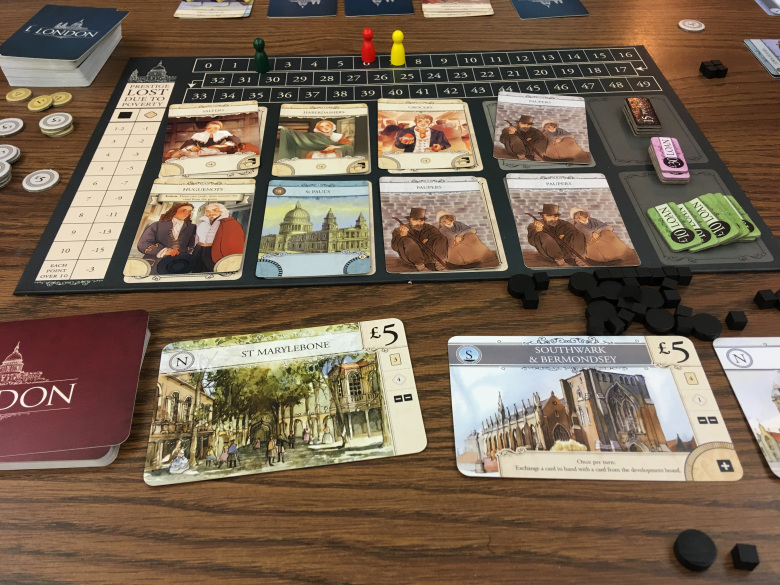 In London, designed by Martin Wallace and published by Osprey Games, 2-4 players are working to rebuild the city after the Great Fire of 1666. The process will take decades and players will need to purchase land, develop their boroughs, and run their city in an efficient manner to avoid poverty and debt. 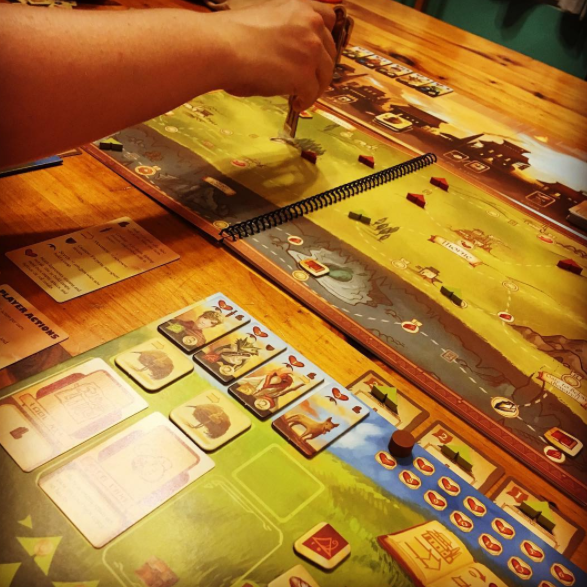 If you enjoy city-building card games like Machi Koro, San Juan or Imperial Settlers, London is a perfect “second step” into more strategic games. The theme is accessible and it can be taught and set-up quickly. Despite the thin rulebook, the game has a surprising amount of strategic depth as you struggle with which cards to purchase, when to take loans, and when to best run your city. Bunny Kingdom is a card drafting, area control game from Richard Garfield, designer of King of Tokyo and Magic the Gathering. 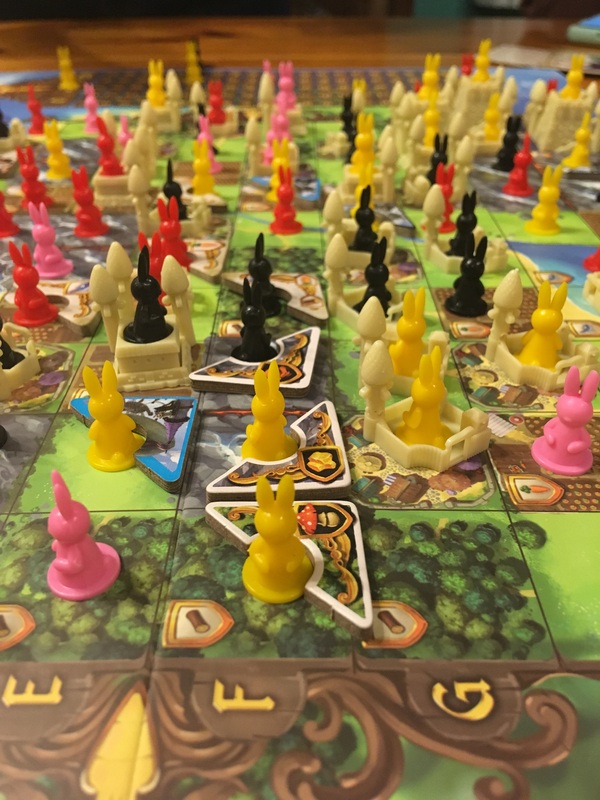 Each player takes control of a crowded warren of rabbits seeking to expand and explore new lands. As you draft cards, your kingdom and options to score points will grow. But in order to do well, players need to make sure they diversify their resources, broaden their scoring potential and adapt their strategy to some friendly hate drafting. Bunny Kingdom has plenty for all sorts of gamers. Fans of Sushi Go! can move into a larger decision space. Fans of 7 Wonders can find enjoyment in a similar level of complexity but with an added element of area control. Fans of Small World may enjoy the added element of drafting. And everyone will be charmed by the cute artwork and tiny bunny meeples. The drafting is seamless and the area control is surprisingly friendly. In Near and Far, 2-4 players are competing explorers roaming the land in search for the mystical Last Ruins. To accomplish this, the players will explore across several maps (and game sessions) hunting for treasure, discovering artifacts, setting up camps, avoiding bandits, and completing quests through a large, “choose your own adventure” style storybook. There are two broad choices of what to do on a turn: Stay in town to prepare or go out adventuring and explore. Once you think you are properly outfitted for a journey, you head out into the wilds to try your luck. The better you prepare, the further you can travel, and the better story you tell. You can focus on battling threats, courting the locals, discovering relics and treasure, completing trade routes, or quest-quest-questing until your little lizard heart’s content. Either way, Near and Far provides an experience that is worth delving into. The Lost Expedition is a cooperative card game where players control an expedition searching for the legendary city of El Dorado. 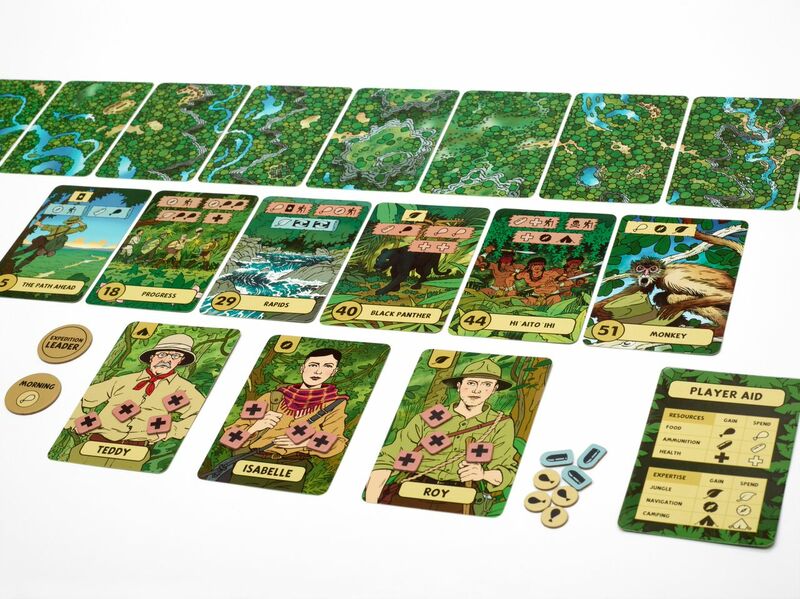 You will need to carefully manage food and ammunition while focusing on the many pitfalls and challenges the jungle will definitely throw at you. Success is simple: Have at least one member of your group of three survive to the end. You will take two jaunts into the jungle each day, setting your agenda by playing a path of event cards. Each card provides different options and when resolved can move your party closer to your goal but the choices are tough. 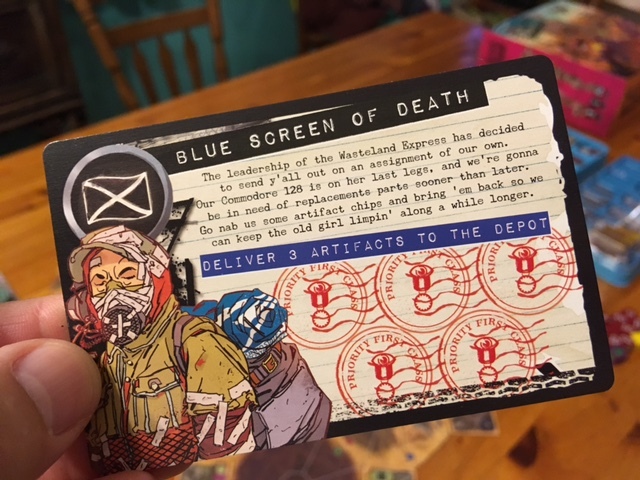 With cooperative gameplay, exceptional representation, tough decisions, and beautiful art from Garen Ewing, The Lost Expedition is an exciting addition to any library collection. It holds true to its literary inspiration — The Lost City of Z by David Grann. 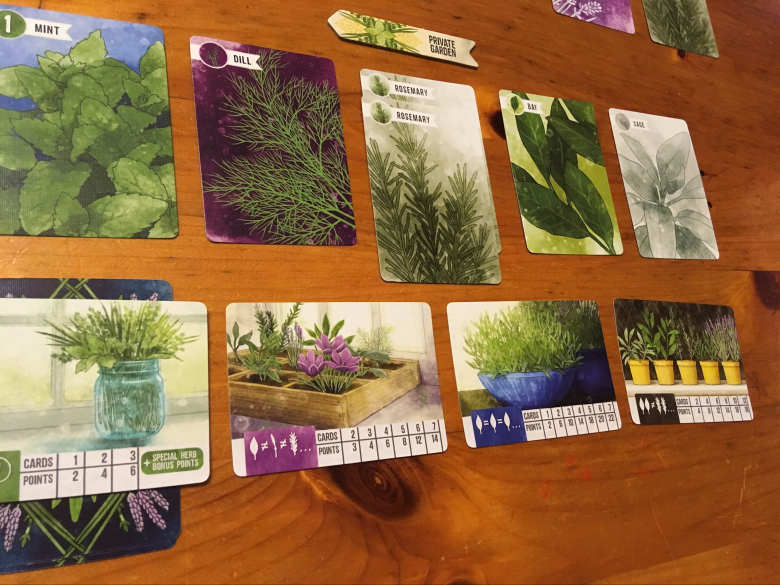 Herbaceous is a simple set-collection card game, with stellar artwork from Beth Sobel, where players are competing to pot herbs by the strategic placement, and swift collection, of sets of cards. Each player has exclusive access to their personal herb garden and shared access to a community garden. The turns are simple. First, a player can optionally pick up herbs from both their private and/or the community garden and place them in one of four containers for points. Then two cards are drawn one at a time. They can decide to either keep it in their personal herb garden or put in into the communal garden. If kept, the next card they draw goes to the communal garden; if placed in the communal garden, the next card goes in their personal garden. In Photosynthesis, players are each a unique species of tree attempting, through careful planning and cunning abandon, to find a place in the sun to generate energy, grow, spread seeds, and eventually be harvested for points. 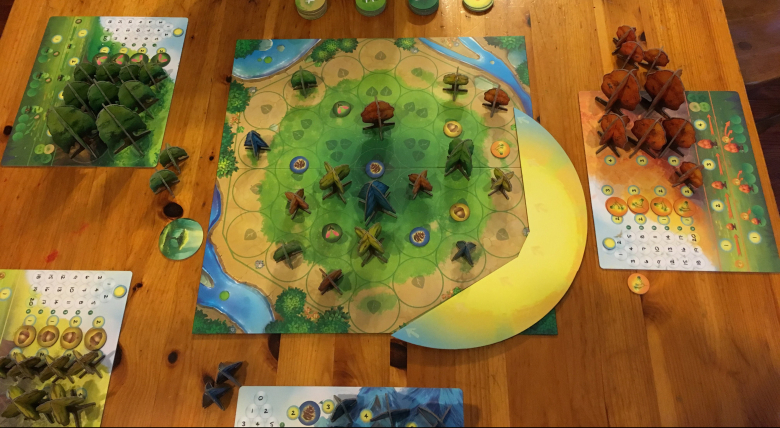 As your trees grow and spread, they gain more access to the sun as it rotates around the board. But be careful! Competing trees can tower over you and block out that precious sunlight. This is a gorgeous game. As the game progresses, a colorful forest canopy emerges, with trees spreading out, growing tall and eventually falling away. The rules are simple enough for a new player to understand the core concepts after a few turns. And despite the colorful backdrop, hidden beneath is a surprisingly tense game as you jockey to position your trees optimally while carefully watching what other players are doing. This is a beast of a game and I would never recommend it for circulation, but while draped in an aggressively busy post-apocalyptic setting and featuring an intensity of artwork that would make Tank Girl blush and Mad Max *finally* go home, WEDS is a delightfully chunky mess of a game with a solid pick-up-and-deliver frame. It takes a while to set up and the rules are extensive. However, once you get this game rolling along, it just keeps on trucking into blissful oblivion. 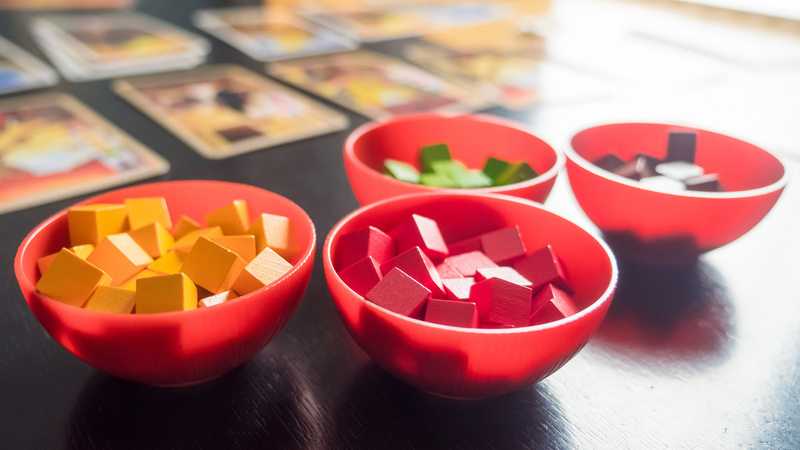 I don’t think any game this year has made as big and far-reaching a splash as Century: Spice Road — from Plan B Games and Emerson Matsuuchi with artwork by Fernanda Suárez. It is played at every board game event I have at the library and I always have a copy available. Players are caravan leaders traveling the silk road to deliver spices. Each turn, players perform one of four actions: They can purchase a market card to put in their hand or take the free one. They can play a market card from their hand to produce, upgrade, or trade spices. They can spend spices to fulfill a demand and claim a victory point card for points. Or you can rest and pick up all the cards played back into their hand. The game ends when someone collects the fifth victory point card. It is a wonderfully quick and snappy and plays well with two all the way up to five players. What even excites me more about Century Spice Road is that it is the first game in a planned trilogy of games from Plan B Games. The next of which, Century: Eastern Wonders is coming out this summer. Each game can be played separately or combined together. And if Century Spice Road sets the tone for the quality of production and design, the rest of the trilogy will be amazing. If you purchase any game for your library, make it this one. It is a staple.